Algiers (AFP) - Hundreds of thousands of Algerians demonstrated Friday a month after ailing President Abdelaziz Bouteflika's bid for a fifth term sparked a protest movement that shows little sign of abating. Despite bad weather, people marched for several kilometres (miles) through one of the main streets of the capital Algiers for more than four hours to rally at the Grand Post Office in the city centre. Like the past two Fridays, the Muslim day of prayer, when record numbers of protesters rallied in Algiers, drums and horns cheered the demonstrators as the crowds clogged other major roads. Security forces said "hundreds of thousands" of protesters gathered in central Algiers and that demonstrations were also held in 42 out of the North African country's 48 provinces. Demonstrators took to the streets of second city Oran and across the country of 40 million people, according to Algerian media and social networks. 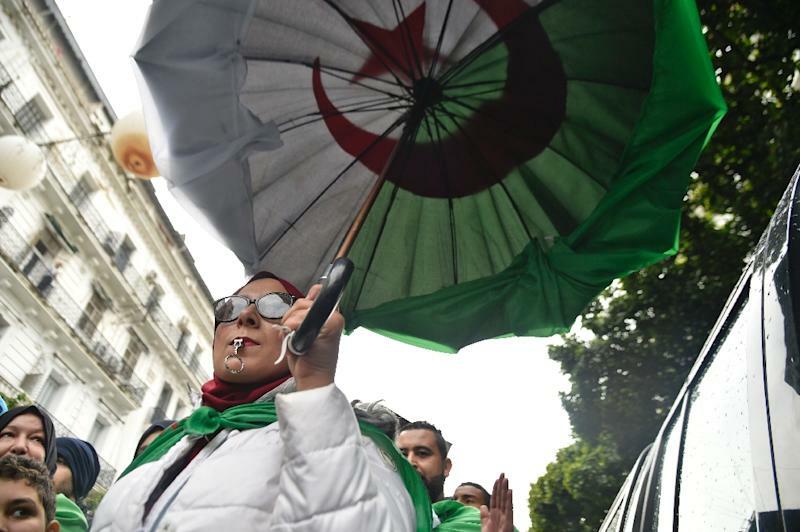 Foreign diplomats say "millions" of Algerians have rallied against Bouteflika's plans to extend his two-decade rule since the protest movement began. 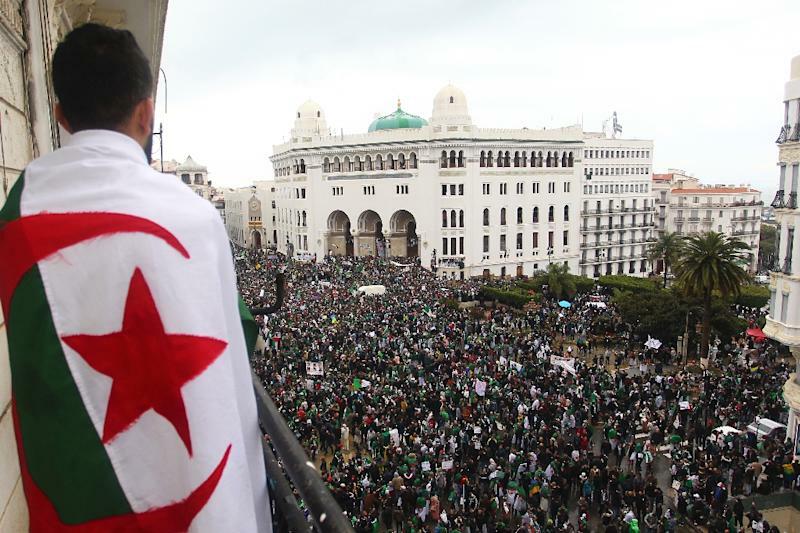 Now an indispensable accessory for protesters, the green and white Algerian flag with its red star and crescent moon could be seen everywhere draped around shoulders, flying from balconies or held aloft and waved. "Stand down," read one banner. Friday afternoon police used a water canon and tear gas to prevent a group of demonstrators from breaking through a security cordon to try to reach a road that leads to the presidential palace. No one was hurt and by nightfall the protests in the capital -- largely held in a festive mood with music, dancing and free food offered to the marchers -- ended. But retired civil servant Zineb, 59, said she would continue demonstrating "in rain or snow, until this rotten regime falls". Bouteflika said on February 22 he would run for a fifth term in April 18 elections, despite concerns about his ability to rule. The 82-year-old uses a wheelchair and has rarely appeared in public since suffering a stroke in 2013. Following early protests, he made the surprise announcement on March 11 that he was pulling out of the race -- and also postponed the polls. Protesters initially greeted the move with elation, but staged further mass demonstrations once they realised he intended to remain in office. On Friday, many had again travelled far to attend demonstrations in the capital. "I will march every Friday, until there is a radical change" to the system, said Younes Laroussi, an unemployed 24-year-old from Tiaret, 270 kilometres (170 miles) from Algiers. In the northeastern city of Annaba, local journalists said "many people" took to the streets despite heavy rains that flooded the town. Demonstrators also braved "the cold weather and storms" to pack the streets of Tizi Ouzou east of Algiers, with one protester, Mokran Zarabi, saying it took three hours to cover just 600 metres (yards). 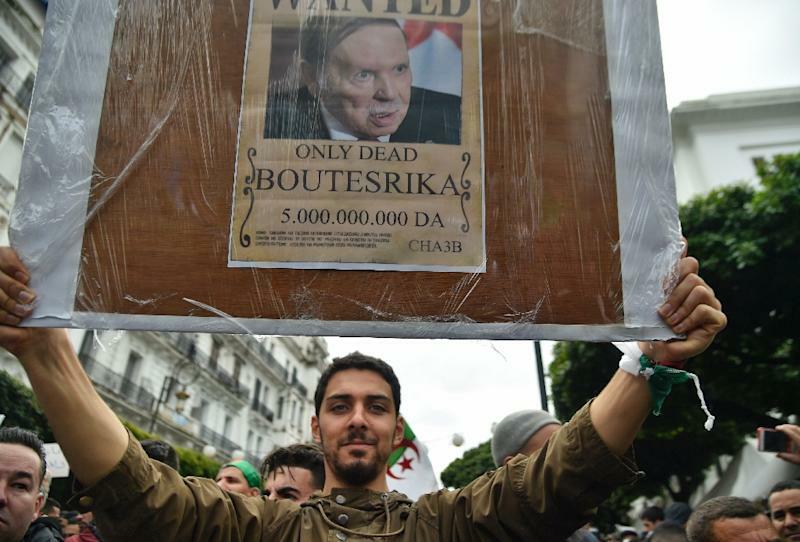 Organisers used social media this week to call for further protests against Bouteflika and his entourage in the former French colony. "The Algerian people demand the immediate and unconditional departure of President Bouteflika," read one widely-shared post, which urged that "the leaders of countries that support Algeria's illegitimate power stop... their interference". The demonstrations, unprecedented since Bouteflika won a first term in 1999, have remained largely peaceful. The government has responded with promises of political and constitutional reform. Authorities have pledged to hold a "national conference" to discuss reforms, followed by a referendum on a new constitution and eventually the election of a new president. Deputy prime minister Ramtane Lamamra on Tuesday promised "open and transparent" steps to resolve the political crisis, as Algeria's ally Russia backed his government's plans. Lamamra said Algeria was developing a "concept of a future state" and that a new constitution would be written "on the basis of an open and transparent discussion". The national conference would decide the date of future elections, he said, adding Bouteflika was "ready to fully transfer his powers" to a new president. But students, professors, medics, lawyers and magistrates have continued to protest this week and cracks have emerged within Bouteflika's own regime. His National Liberation Front party said Wednesday it supports protesters' calls for change, while the main trade union confederation and business organisation have been hit by dissent and resignations over their leadership's initial support of another term for Bouteflika.